I have not had a nice wood grained .22 since I left college, so it was a treat to keep one in storage for a family member who was going to be spending a few years overseas. This particular .22 rifle is a Marlin from the late 70s. It spent almost 30 years in the humidity of Arkansas, being bumped around the woods of the Ozarks. After that, it spent some time in a garage in Michigan. It was a well taken care of gun, but it had suffered some from the weather, and lets face it, it had been a boy's first gun. There was some checking in the wood, plenty of rust, and a slight warp in the stock. The easiest thing would have been to strip everything down, straighten the stock, and re-finish... BUT, There is something to be said for preserving the years of use and the battle scars. After talking to the owner I got to work. 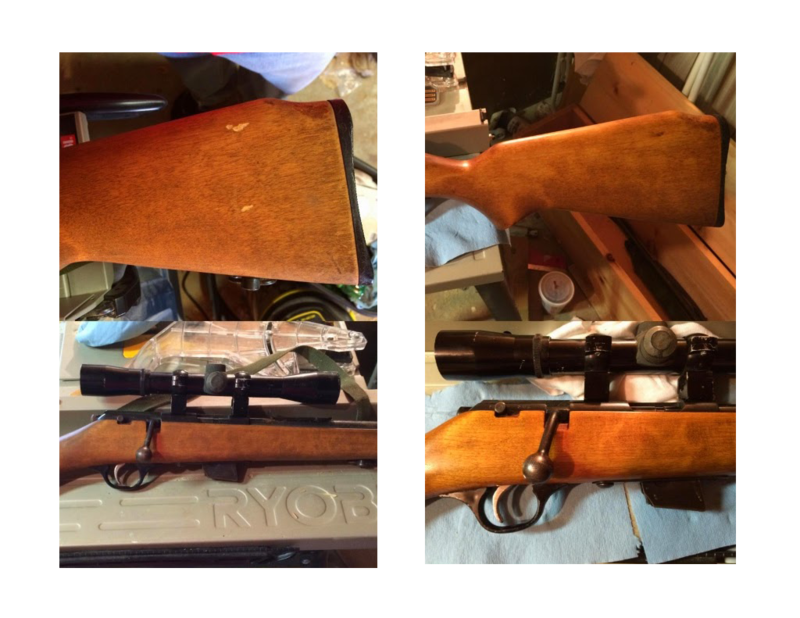 2 screws removed the barrel/receiver assembly from the stock, were the stock was straightened and splits repaired. After that the stock was cleaned and given a gentle re-finishing. For a finish, I used a mixture of turpentine, boiled linseed oil, and apple cider vinegar. 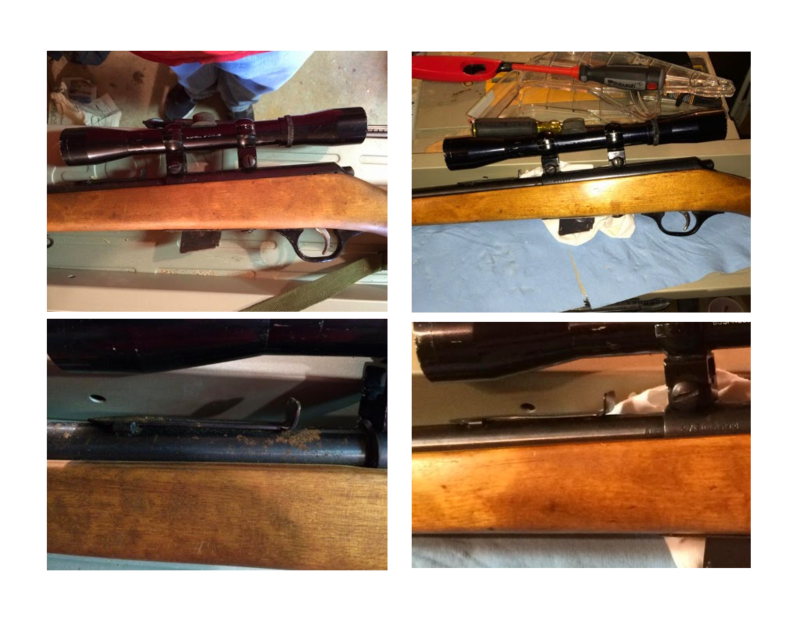 Barrel was cleaned, treated, and re-blued. Everything re-attached, and scope was sighted in. BEFORE pictures are on the left, AFTER pictures are on the right. Click on the pictures to enlarge. Working on firearms, does put me in mind for grilled steak. Grilling steaks have always scared me. 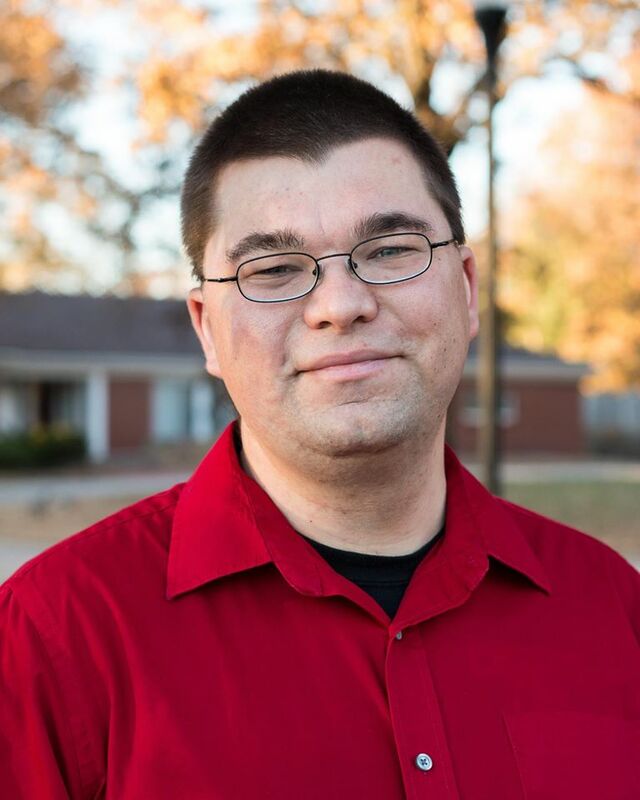 I have been grilling since I was 12, and I feel confident in burgers, brats, chicken, chops. I'll smoke anything in the smoker... My steaks have always come out too chewy, or overcooked, or flavorless. Last January, after eating at a great steak house, I resolved to solve my steak phobia. The method I have ended up with is supported by various internet blogs, and Cook's Illustrated. Reverse Searing is really very simple, and makes great sense. Essentially, after seasoning the steaks fairly simply... lots of salt, some pepper, a little garlic and onion powder... the steaks are put on the cool side of the grill. On my grill, I turn on 2 burners and leave the steaks over the 2 burners that are left off. I leave a remote temperature probe in one of the steaks and let it all slowly cook. At 90 degrees F I flip them. At 115 degrees F I put a little melted butter on both sides of the steak, crank up the hot side, and finish the steaks up to about 135 degrees on the hot side of the grill. When the steaks come off, they each receive a nob of compound butter. The result is a nicely seared steak, with a nice pink/red band that is even all the way through from edge to edge. The other part of my secret, is quality meat. This is a Creekstone Farms Ribeye from Douglas Avenue Chop Shop. When you watch for specials, you can get a great deal on awesome cuts of meat from a quality butcher. 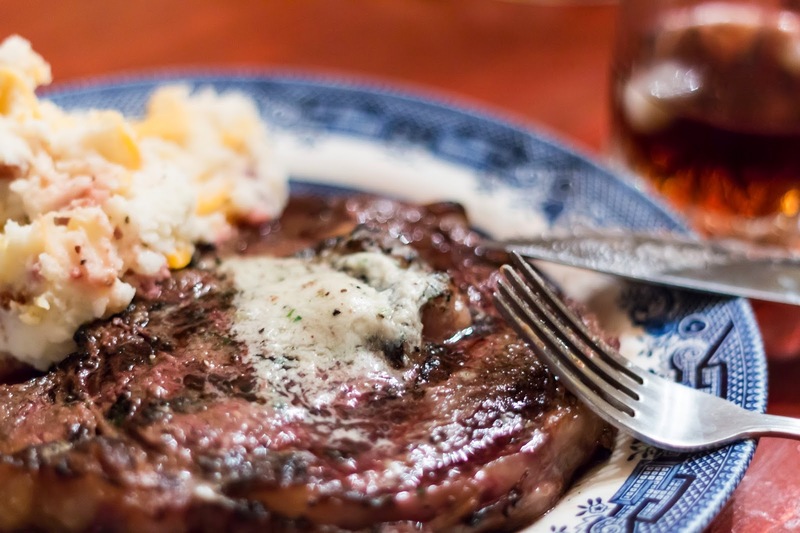 This particular steak was finished with compound butter made with Plugra butter and roasted bone marrow. What do these have to do with each other, you may ask? A quality grilled steak and a cleanly refurbished rifle are tributes to an attention to detail, quality workmanship, and quality raw material. It is easy to get caught up in high priced steak houses and brand new rifles, but recovering a loved firearm or grilling a steak on your own equipment does give you a lot of pride and does, genuinely, add to the enjoyment of the experience over all.